Continuing where the popular Grandia GD05 left off, the Milo ML03 HTPC case again combines the full size features of Grandia series with small form factor dimensions. The slimmer Milo ML03 has a profile of 105mm height and 340mm depth, making it extremely easy to integrate into any living room furniture. Incredibly, this case can accommodate up to three 3.5” hard drives or five 2.5” HDD/SSD through its smartly designed drive cages that can mount either size without any use of adapters. For cooling, the ML03 can be fitted with up to four 80mm fans so users can choose to build a quiet system with low power components or a powerful HTPC with 140W CPU if needed. 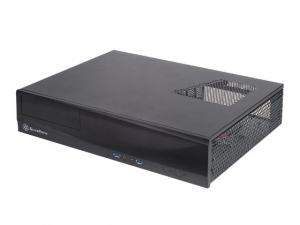 There are also numerous small touches including pre-cut hole for VGA (D-SUB) connector, Kensington lock support, and an additional full size expansion slot for installing extra motherboard I/O, fan controller, or accessories products such as CLEARCMOS. For those looking to build an HTPC with good expansion and cooling capability but has limited room and budget, the SilverStone Milo ML03 is the one to get.